Characterized by a purity of vision, Barry Le Va's works on paper are references to his varied and complex sculptural installations of wood, aluminum, glass, and flour. Although a member of the founding generation of Minimalism and Conceptualism, Le Va's work has continued to reflect a vigorous involvement with contemporary art of the last three decades. This exhibition will take the viewer through the evolution of nearly 40 years of Barry Le Va's drawings and will also highlight his interest in photography. 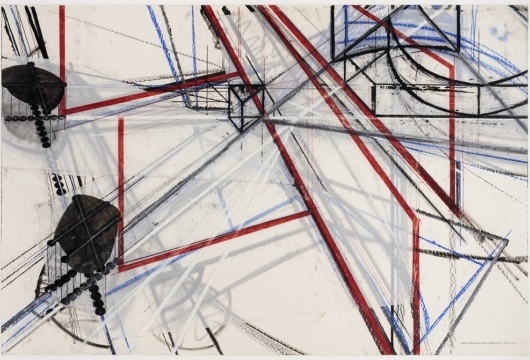 The critic Jerry Saltz has described Le Va's works on paper as "a key to unlocking the heart of his contentious art." Executed in ink and graphite and often incorporating collage elements, the drawings are comprised of squares, ovals, rectangles, and meandering lines. These coded works are as much maps or diagrams as they are abstractions. Recent drawings evoke battle plans, circuits or flow charts. A reception for the artist will be held on Wednesday, January 24, 2001 from 6-8 p.m. Regular gallery hours are Tuesday-Friday 10-6 and Saturday 11-6.